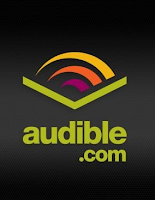 Audible.com has a vast collection of audiobooks, for children and adults. Audiobooks for children cost between $10 and $20, depending on the length. While this might seem expensive, I would argue that $15 for 7 hours of entertainment is good value, especially if it can develop a love of books. The best feature of the Audible books is that my phone automatically remembers where I paused listening to my book. Even if I listen to music or another podcast, when I go back to my book - it remembers! I've even found that I can skip or rewind by chapter. They have an extensive selection for kids and young adults. Your school library: Ask if your school provides access to downloadable audiobooks. Berkeley Unified School District subscribes to Tales2Go for all of our elementary school students and teachers. 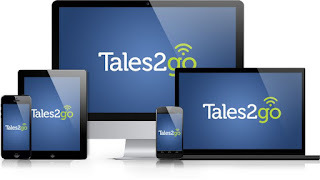 Tales2Go streams audiobooks to listeners' devices at school or at home. They have over 6,000 titles available. Students have unlimited access to titles, so there's no waiting for a book to become available. This summer, I've listened to Harlem Charade through Tales2Go and loved it. Your public library: I borrow e-audiobooks through my public library using a variety of different providers. Overdrive, Hoopla, and Axis360 all provide services that my local libraries use. Your library subscribes to these services; you download the free app and sign in with your library card. Using Axis360 through the San Francisco Public Library, I was able to download How Dare the Sun Rise, a new YA memoir by Sandra Uwiringiyimana. and my daughter downloaded The Lightning Thief by Rick Riordan. It took less than 15 minutes from start to finish. It was a smooth, easy process. Unlike borrowing CDs from the library, there are no late fees; when your book is due, your access stops. You can borrow it again later. For popular titles, you might need to place a hold -- but it's easy to do through your computer. 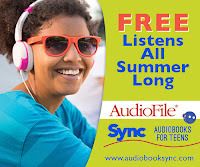 SYNC Audiobooks for Teens: SYNC is a free summer audiobook program for teens 13+, sponsored by AudioFile Magazine and delivered through Overdrive. SYNC is giving away two complete audiobook downloads a week - pairs of high interest titles, based on weekly themes, from April through August.